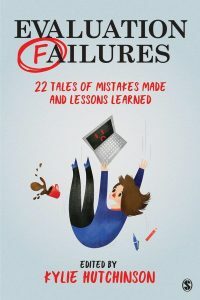 Evaluation Failures is a candid collection of stories from seasoned evaluators from a variety of sectors sharing professional mistakes they have made in the past, and what they learned moving forward. Dive into these engaging, real-life examples that are both entertaining and informative. Each story offers universal lessons as takeaways, and discussion questions for reflective practice. These real-life blunders in the field will leave you shocked, laughing, and definitely wiser. The book is the perfect companion to anyone working in the evaluation field, and to instructors of program evaluation courses who want to bring the real world into their classroom. CES and AEA members - order directly from SAGE Publications and receive a 20% discount!